It is good that my blog has some traction and in fact some have started to email me - which is good. I will try my best if I can to provide my opinion. When I started this blog, I wanted to sort of be different. My personal journey into stocks have brought me to like and trying to understand companies, financials as well as the intricacies of beautiful businesses. Beautiful businesses can be very hard to find. Many have sort of asked opinions on all kinds of sectors. Sorry to say that I am no expert in many sectors in fact although I am learning by the day. No one can know all industries. All I can say is that my journey into world stocks especially US have provided me with a steeper and faster learning curve. It is actually tougher than Malaysia as we probably have the least volatile market. Anyway, one should always be on a lookout for healthy fantastic businesses. They can be overpriced though - which we should avoid. One may ask, why good quality businesses and not just look for cheap ones which are undervalued? After all Benjamin Graham's principles have been to look for that moat, margin of safety. If a company we find after our valuation is worth RM1 billion for example, the margin of safety of 20% will cause us to buy at below RM800 million valuation. Well, let me take out a company which I do not buy but it is a beautiful business nevertheless. I do not buy it because it is expensive and I think I can find better value elsewhere - Maxis. 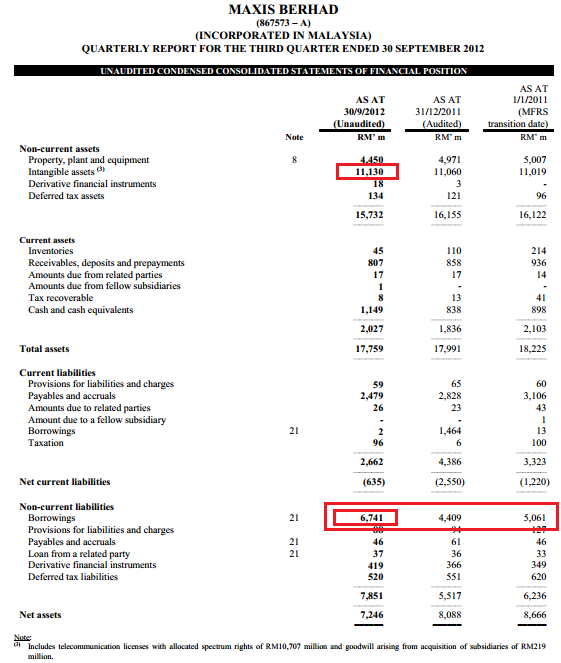 Look at the cash to borrowings. The borrowings is close to 6x its cash. Again, imagine if you do not know it is Maxis. But yet, people are valuing the company today at almost RM50 billion - i.e. one of the Top 10 largest company in Malaysia??? It is not that overvalued. Look at the borrowings, it is still growing. Which bank would lend to a company with this balance sheet. But yet it is borrowing more than RM6.7 billion with a negative NTA. Still, I think the CFO has one of the easier job in Malaysia. He is probably only worried whether the dividend amount is sustainable but definitely not losing sleep over the debt number... Why? Again cashflow and the predictability of the cash that it can bring in. The second part is more important - predictable cashflow. And bear in mind, Maxis is paying more than RM2.5 billion dividends a year. Only consistent cashflow and the predictability of it can pull that out. Imagine a business that generates free cashflow of RM2.5 billion in one year and another year it generates negative cashflow. What would a bank (or bond subscribers) do? Now ever wonder why a quality company with good consistent cashflow is important. It does not need to keep the current portion of the cash in fact - and people still believe in the company. I have invested in Maxis almost from Day 1 of its re-listing. However, I have sold half of my holdings last year when its share price exceeded RM6.80 (Dividend Yield below 6%). My main reason for reducing my holdings is mainly due to the fact that valuation even from a DDM perspective is getting a bit stretch. Looking at their last few quarter results and you can see that Maxis is struggling to grow its revenue and bottom line mainly due to saturated mobile market and high capex & opex to compete in the highly competitive broadband market. Once interest rates begin to rise which is expected after 2nd half of 2013 due to higher inflation, Maxis' borrowing cost will also rise due to its high gearing. This will impact its free cash flow and ability to maintain its 40 sen dividend payout yearly as current dividend payout ratio is more than 100% of its free cash flow. Your views on my comments is much appreciated. Like I said, the CFO's bigger headache or rather CEO is to maintain the dividend not the debt. The debt he will rollover. Maxis is yes, having problem maintaining market share. The pie of Maxis had been eated by Digi and Celcom, this few years we saw tremendous result by Digi. Which i know why the new CEO has a lot of work to do. Maxis dividend "policy" is not sustainable, which is why the company will be restructuring its future dividend payouts. I work in Maxis but I don't invest in the company, at least not yet, I didn't even take up the ESOS. Instead, I am heavily invested in the yellowman. Also, Celcom will overtake Maxis market share in post+prepaid anytime soon. Great stuffs from an insider. Haha. Wow!!! Maxis just hired ex-Digi CEO. They definitely hired the wrong one. Do take a look at Axiata, the management has change a lot after Kamaruddin take over the CEO post. 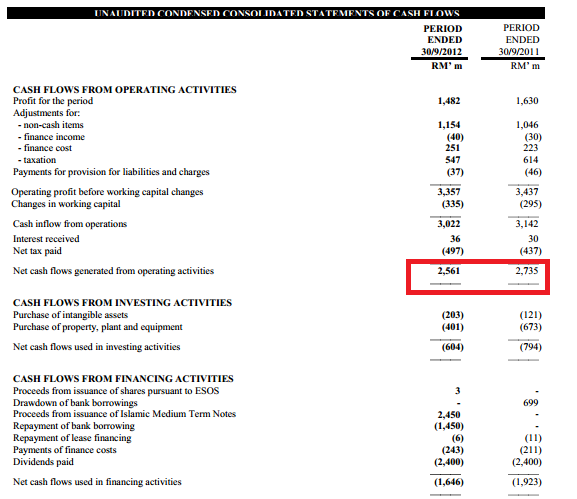 And take note of its cash flow and profit, the value added point is their exposure of regional business. Ya, Axiata is definitely the more promising one among the mobile telcos, its growth path look more exciting. I think you are referring to Jamaluddin? ex- Maxis CEO? Once I sat next to him attending a forum - very nice guy. The reason I pulled out Maxis is because its balance sheet is rather unique (really high debt, low equity, low cash) - never meant to provide any recommendation. Wow..Maxis taking full advantage of its credentials and ak..doing business at its best using OPM to the max...how many businesses can afford to have balance sheet as such...unique indeed! I agree, Time.com is the emerging contender. I work in the telco line and this company is the one to look out for!